Modern Handleless kitchens are the latest trend in kitchen design. A sleek uncluttered spacious feel can be achieved when opting for handleless kitchen doors. 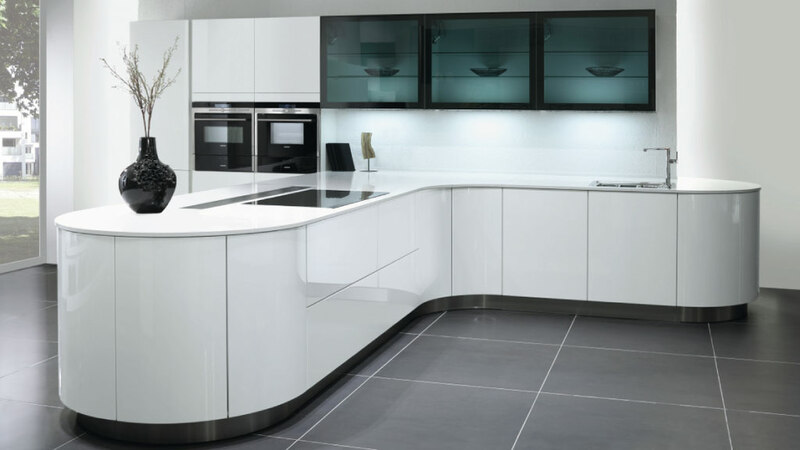 At Alexanders Kitchens in Warrington, Cheshire, we provide an exceptional choice of handleless kitchen styles to choose from. 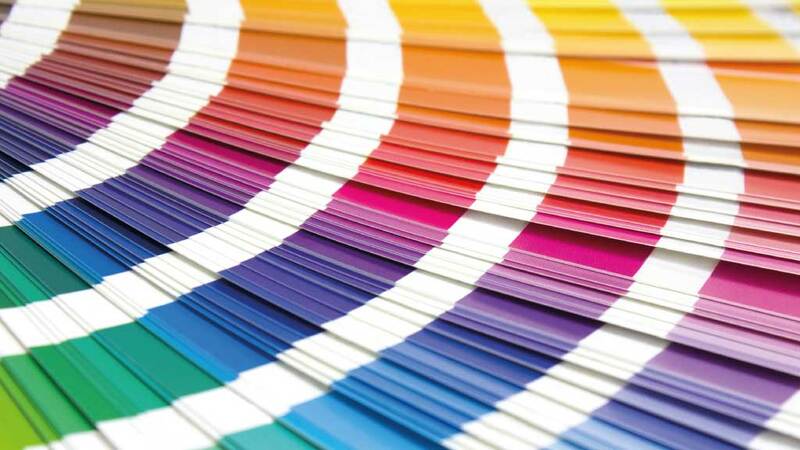 We have many standard colours and large selection of bespoke painted colours available. Matt Handleless Kitchens look excellent with the right type of kitchen lighting. The door surfaces are much less reflective than the high gloss alternative. This gives a less glaring feel to the overall appearance. The effect of a matt painted handleless kitchen is more of a diffused colour. When selected in the right setting it looks very classy and understated. If good light is present within the room intended for a new kitchen the matt painted handleless doors are likely to be the right choice. High Gloss Handleless Kitchens are the modern day “wow factor” first choice when deciding on a kitchen door finish. Glossy, sparkly, new and clean looking. uplifting and vibrant is what this door does best. 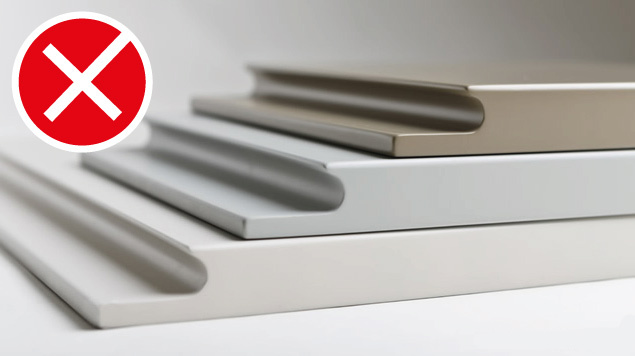 A high quality gloss painted finish in the colour of your choice can really stamp your own scheme and style into a new modern fitted kitchen. Great for rooms where natural light is sparse. The high gloss handleless kitchen doors really help to reflect light around the room. This creates a spacious feel where it would otherwise feel cluttered. A more traditional style kitchen door with all of it’s detail may make the room feel enclosed and overcrowded. Less really is more with a high gloss handleless kitchen door. Our bespoke painted kitchen colour palette is vast. However, if you cannot find a colour from our large selection, don’t worry. 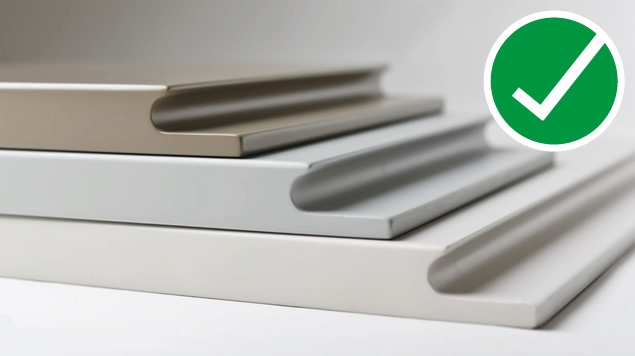 We offer a RAL colour matching facility on painted door styles so you can get the exact colour you’ve been looking for. 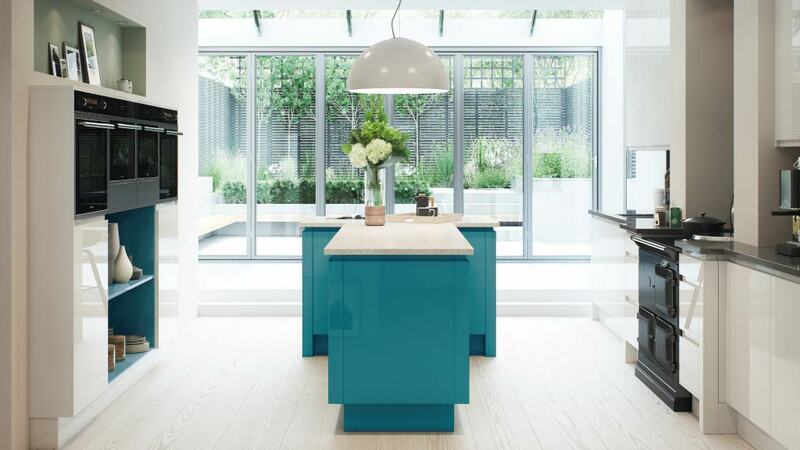 This is useful if you have an overall colour scheme that you want to incorporate in your new kitchen design. Want a unique colour that nobody else has? It is possible, and it can make for a very impressive coordinated space in your Cheshire home. Clean lines and a simple modern design. Sometimes classed as ultra modern, this door is sleek and clutter free, almost clinical. No handles means more working space within the rooms floor area as there are no protruding handles from the face of the doors. Less things to go wrong over time means durability, this style of door leaves no option for a failed handle screw, although not a difficult problem to solve once you go handleless it will never be a problem again. The handleless groove can become grubby after time and requires cleaning to keep it looking fresh. As always the customers usability of a considerable purchase such as a new kitchen is my main focus. I have tested a few customers who suffer from arthritis in the hands, the result is conclusive. 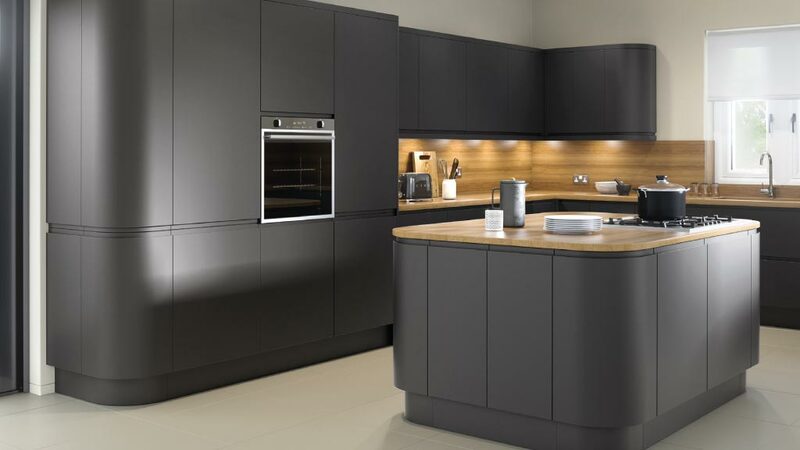 Despite liking the handleless kitchen style aesthetically, they have all agreed that it is more difficult or sometimes more awkward, even a pain to grasp the handleless doors when compared to a good handle with plenty of space in the arch which allows an easier and better grip. This is especially apparent when tested on integrated dishwasher doors and integrated freezers which require more force to open due to the sealing requirement and function of the appliance. This factor is important and must be considered as it will ultimately frustrate and reduce the quality of use and functionality of the kitchen for that customer. In my honest opinion when faced with this issue there is no better solution than a good handle that performs its function flawlessly. Besides, we have hundreds of great handles to choose from that work perfectly on our other kitchen ranges which may better serve your requirements in light of this information.